Vascular Neurology, Vascular Neurosurgery and Interventional Neuroradiology are independent fields with dedicated Training Programs. Neuroimaging, and in particular what we call "Neurovascular Imaging" is a unifying factor which can be considered the intersection of these three medical specialties. 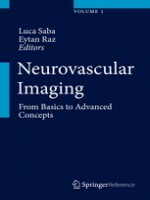 With this book we aim to cover thoroughly the imaging techniques, potentialities, and present and future applications as applied to all the vascular diseases of the central nervous system from the imaging point of view. This book will comprise eight main section—The Basics, Arteries of the Head and Neck, The basics of Intracranial Arteries, Diseases of the vessels, Stroke Imaging, Veins Imaging, Spine Imaging and lastly, Paediatrics. This book presents useful protocols and techniques, enabling readers to introduce these technologies into practice and points to synergy between the field of radiology, neurology as well as neurosurgery and endovascular neuroradiology. It also offers a teaching tool with a focus on neurovascular disease in neurology, from the imaging point of view by covering evolving imaging modalities and research, bringing readers the state of the art.